One of the most hyped bikes at this year’s Saddle Drive was the All-City Cosmic Stallion. I’ve personally owned the original Space Horse for the number of years and was curious to see how the Cosmic Stallion would be different. The folks at Joe Bike in Portland, kindly let me get one dirty. Check out the video for the ride review. If you want the written executive summary, scroll down. As, always, if you love the video reviews, consider being a monthly subscriber to help keep the lights on. Overall, the ride quality of the Cosmic Stallion remains similar to the original Space Horse, which isn’t necessarily a bad thing. Think of the Cosmic Stallion as a more modern and slightly more performance oriented Space Horse. I was hoping for more noticeable gains or changes with the ACE tubing, but it was subtle at best. 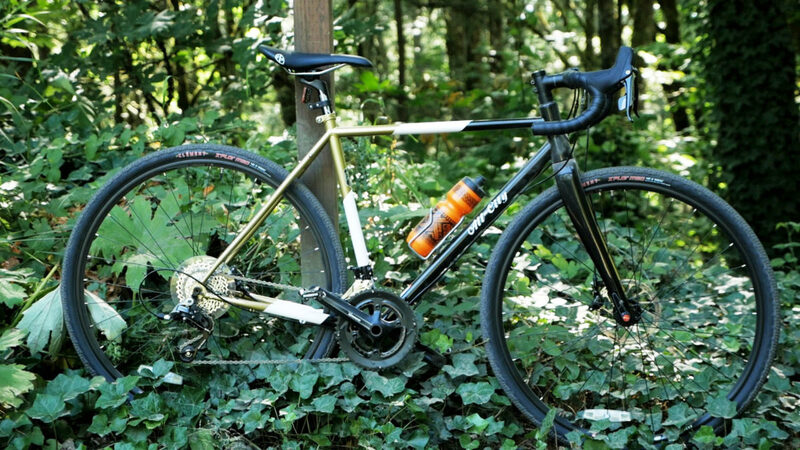 Still, the Cosmic Stallion is a great swiss army knife bike if you don’t already own a gravel/all-road bike. If you do, then the features might not be enticing enough to make you jump ship. -Hyped ACE tubing only gives subtle changes to ride quality. Not as mind blowing as you would think. Hey! On the fence between this and the 2017 Cosmic Stallion as my first all around road / gravel bike. If you had to get one or the other would you splurge the extra $$ on the Cosmic stallion instead of staying with the OG? Depends on your use. If you have any plans to run front panniers, I’d go with the Space Horse Disc. The Cosmic Stallion has no mounts for a front rack. If you plan on doing more unloaded riding or using frameless bags than I’d go with the Cosmic Stallion. I would avoid the OG canti version of the Space Horse, since the brakes are the worst part of it. Personally, I would actually go for the Space Horse Disc with 650b wheels. I wish the Cosmic Stallion was shipping with 650b in the smaller sizes but it is not and that is something I would prob. upgrade almost immediately. This is great feedback! Thank you. Want to ride them both but leaning towards the 2017 SH with 650b even though I don’t really need the front mounts. Thanks so much. What are your thoughts on the Cosmic Stallion versus the Salsa Vaya? Looking for something good for rides like Cycle Oregon (a wide tire road bike that is still reasonably light.). I would say they are pretty similar feeling, both are an all-road style bike. Not particularly quick, but able to handle a variety of terrain. The Cosmic Stallion is lighter but not by much. Honestly, for a ride like Cycle Oregon I would go with something like the Warbird and put on some 30mm slicks. It is lighter than both, quicker in the rear but still stable in the front. A great all day riding bike. What would be a good 650b wheel set for this bike?